Having just been to see the film Monuments Men this afternoon, I’m back in WW2 mode! But this time with a little bit of a twist. During my research for my month of eating rations in January, I came across these two books. The interesting twist on both these books is that not only do they give you a sense of what life was like for women during WW2, but they also bring it up to date: How to be a wartime woman in the 21st Century. 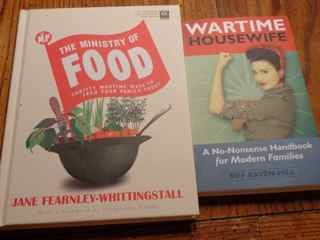 The Ministry of Food and Wartime Housewife. Also, here are two great websites. The first concentrates mostly on wartime recipes, the second (which I only discovered last week) examines women’s lives in the 30s and 40s with an interesting emphasis on the Australian experience. It’s hard work being a wartime housewife. ‘All’ I’ve done this morning is go to the supermarket (where I didn’t have to queue) to pick up my ‘rations’, come home, divide them out for the week, prepare some cauliflower soup for lunch, homemade beef casserole for this evening’s meal, wash up the mountain of dishes that prepping all these vegetables takes and it’s already 12.30pm. How did married women, who worked during the war, manage their time? Seriously, between working, shopping, cooking, cleaning up, looking after the kids and doing laundry, they must have been exhausted. My respect for them grows daily! Once again, I shopped the perimeter of the store, picking up fresh produce, but I did dip down into the centre aisles to make one major decision. As well as rationed and unrationed foods, there were also foods only available on ‘points’ – each person got 16 points per month. What you could buy with these points varied depending on supplies. So what to spend my valuable 16 points on today? 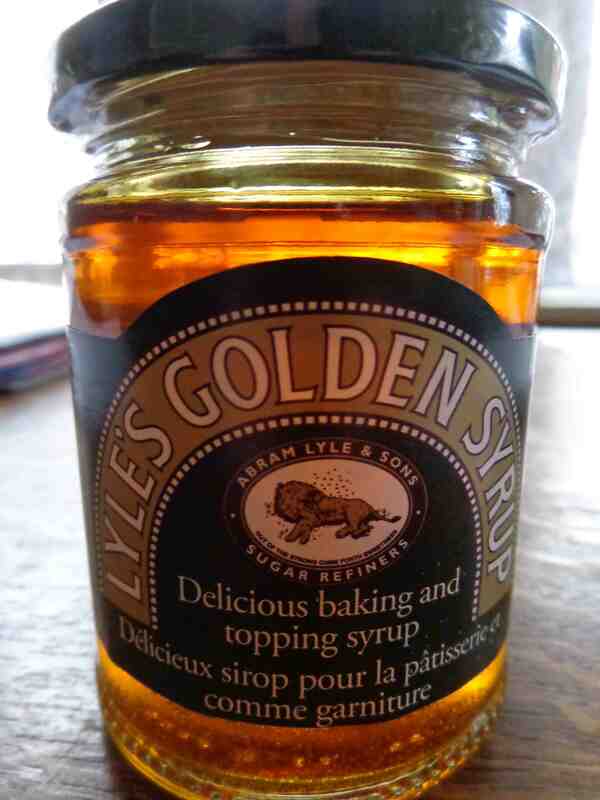 Having gone back and forth through the recipe books, I’ve found a lot of puddings that call for golden syrup, so that was my final decision. And doesn’t it look wonderful? 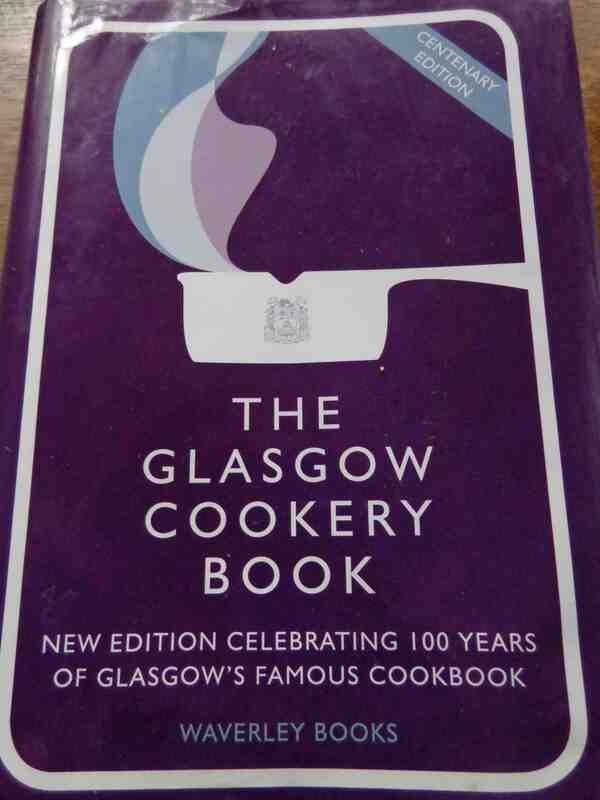 It’s snowing really heavily here, so for lunch I made myself a hot bowl of cauliflower soup from The Glasgow Cookery Book with a bacon sandwich on the side. I have to say, the bacon ration is the saving grace of this whole process. Wartime food can seem so bland, but just adding a rasher of bacon to the soup or sandwich is great on the taste buds! 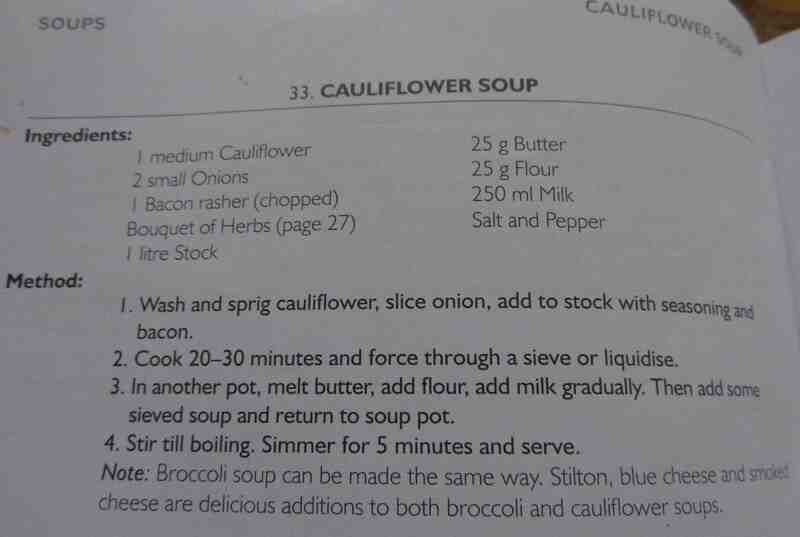 I did adjust the soup recipe a little – I didn’t have a bouquet garni, so I just used a bay leaf, and used one leek instead of the second onion – but it tasted great. Another three course meal for dinner tonight. We started with cauliflower soup. (I’ve made rather a lot of it, so we’re going to be eating it for a couple of days!) 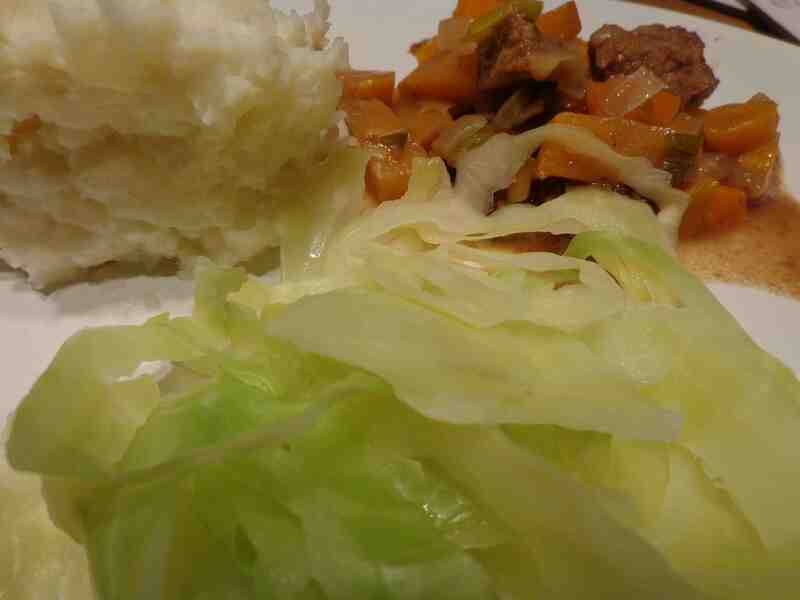 That was followed by a beef casserole, cooked in the slow cooker, served with mashed potatoes and cabbage. It was the first cabbage, other than raw, that I’ve eaten voluntarily since I was a child. You know what? If you cook it in barely any water and add some butter – as instructed on the wartime video, 2 Cooks and a Cabbage, I posted a couple of days ago – it isn’t bad at all. And then pudding – yay! 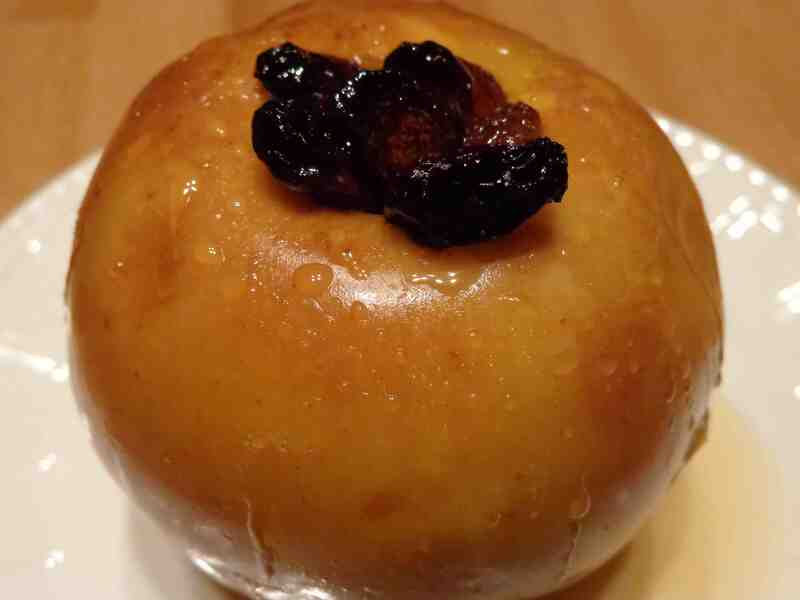 I made baked apples, as per The Glasgow Cookery Book, stuffing them with a mix of sultanas and the delicious golden syrup I bought this morning. Am I full? You bet! I love going to the cinema, so I asked Anne some questions about going to the ‘pictures’ during the war. This week, I’ll be showcasing her answers. Clark Gable was top box office, but then so were James Steward, Gary Cooper, Ronald Colman, Spencer Tracy et al. In Britain it was Leslie Howard who was the biggest name with films like ‘Pimpernel Smith’ and, indeed, ‘The Scarlet Pimpernel’ himself. Bing Crosby was the big singing star and had been for many years, but Frank Sinatra was knocking on the door by 1940 – the rest is history. Crosby teamed up with Bob Hope and Dorothy Lamour around 1940 with the first of their one-a-year ‘Road to…’ films which were tremendously popular. Maybe the biggest change was in musicals: as well as Astaire/Rogers there had been years of Jeanette MacDonald/Nelson Eddy films in Viennese-type or ‘Rose Marie’- type stories. Suddenly the US produced a few films set in Latin America -‘South American Way’ comes to mind; the main star was usually Don Ameche joined by someone like Alice Faye, and later Betty Grable the first pin-up girl, and moved on to the ‘poor glamour girl makes good on Broadway’ genre, until ‘Oklahoma’ changed everything again later on. Having completed one week of eating wartime rations, this evening is an opportunity to work out what I’ve done right, what I’ve done wrong, and plan for the upcoming week. What I’ve done right? Despite many temptations, I’ve stuck to my rations. (We went to the cinema today and nary a piece of popcorn passed my lips!) I’ve eaten more healthily in the past week than I have for a while, and although I slipped a bit vegetable-wise today – it’s been a bit bread/potato heavy – one day out of seven isn’t bad. 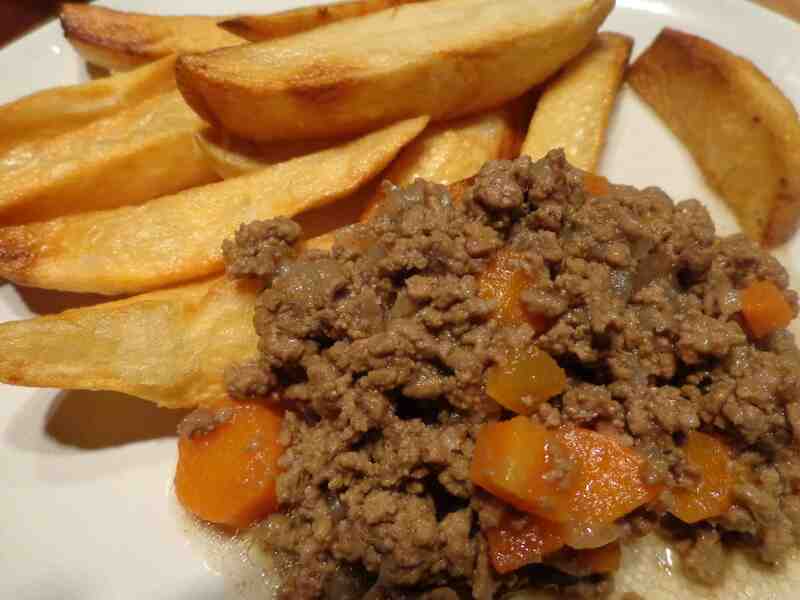 This evening I got a bit of a ‘fat’ craving, so finished up my meat ration with a side order of chips. Making chips at home during the war became more difficult as fat rations were limited, but fish and chip suppers were still available at the local chippie or restaurant. What I’ve done wrong? Because I wasn’t sure how to make the rations stretch for the week, I ended up not actually eating them all. I’ve been left with 2 pints milk, one powdered egg, about 5 ozs fat and most of my sugar. Good news in a way because it means I can add those rations to next week, but bad because the rations were carefully designed for health, so I really should get that milk, egg and butter in to me! The plan for the upcoming week? I had underestimated just how much time cooking everything from scratch would take – even though I’ve cheated a couple of times, microwaving a baked potato for example – so I’ve been a bit sparse adding Anne’s comments and what was going on in the war to my daily postings. As from tomorrow, that will change! One observation about something we take for granted that must have been so different during the war. Driving home from the other side of Calgary this evening, we crested a hill and saw the city spread out in front of us, thousands upon thousands of lights glittering in the dark. Sky scrapers sparkled and traffic lights blinked red and green in the night. It was stunningly beautiful. And as I sit here writing this in my study, I have my blinds open and can watch car headlights swing around corners, enjoy the Christmas lights still twinkling across the road, and marvel at the misty waxing moon rising in the sky. If this had been wartime, I would have had to go outside to look at the moon, and beautiful though the moon is, I find there’s something magical about city lights and the thousands of lives they reflect. In the British wartime blackout, all that life would have been hidden. And frightened, waiting for the bombs to fall. Although I’ve been eating wartime rations this week, apart from experimenting with some soup recipes, most of the meals have been family dishes my mother cooked when I was growing up. 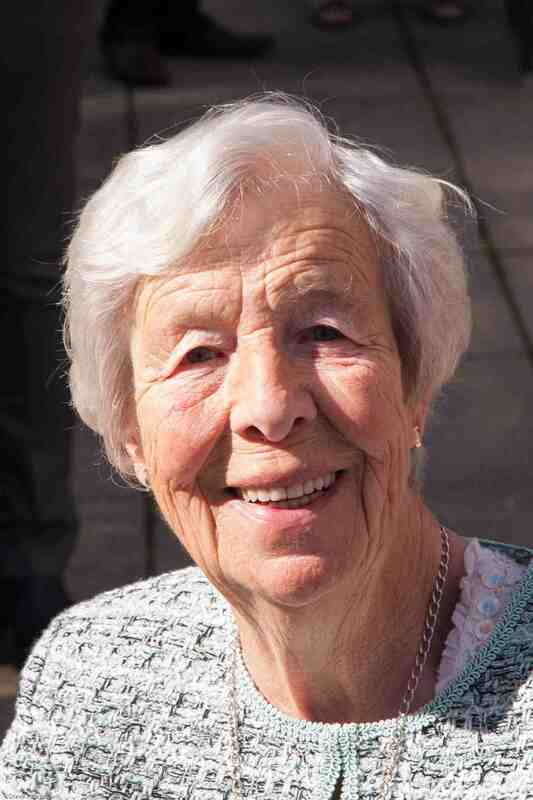 Mum and Dad married in 1938, so with rationing introduced in 1940 and not ending completely in the UK until 1954, she spent 14 out of the first 16 years of her married life feeding her family under rationing conditions. I was born l-o-n-g after the war ended (although not so long after rationing finished), so perhaps that’s why the meals I’ve cooked this week have felt ‘familiar’ and reminded me of my childhood. But at least all those evening meals – so far – have contained meat. Today – apart from treating myself to a toasted bacon sandwich from my rations for breakfast – our evening meal had to be meat free as I’m just about out of our meat ration for the week. 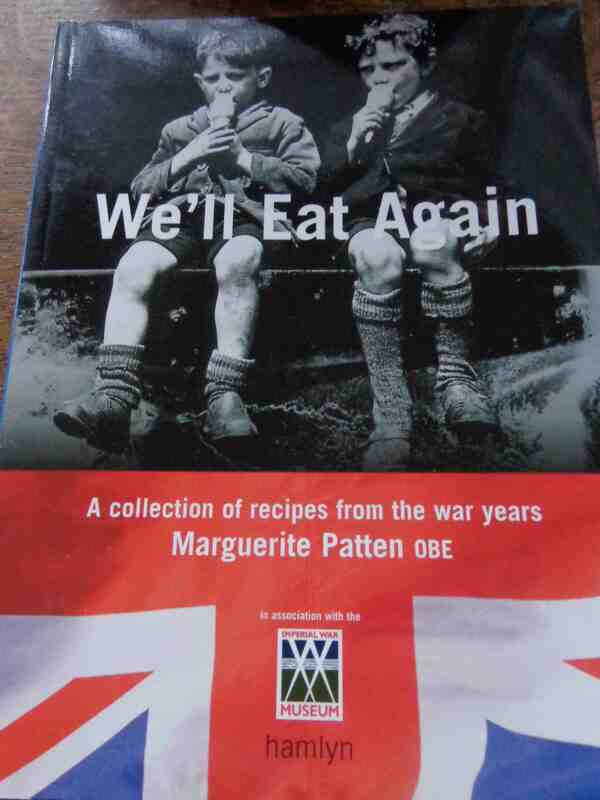 I turned to Marguerite Patten’s book for inspiration. With so many ingredients not available during the war, the index revealed a lot of ideas for ‘mock’ meals; mock apricot flan, mock cream, mock crab, mock marzipan, mock chocolate. I decided I would give ‘mock goose’ a try – even though I’ve never actually eaten real goose in my life. 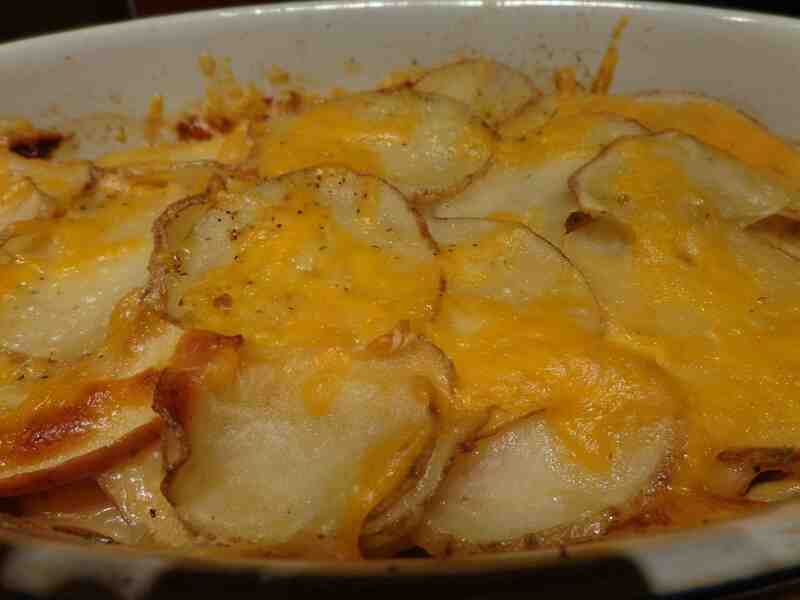 Consisting of apples, potatoes, cheese, stock and sage, it resembled – and tasted – more like scalloped potatoes than anything else. And it tasted fine – for a side dish. I can’t believe I actually found myself craving a juicy steak, lamb chop or chicken leg this evening. And that’s after only 5 days. I’m eating wartime rations out of curiosity, to try to learn a little about what it must have been like on the home front, but in many ways I’m kidding myself. If I’d really wanted to, I could have nipped down to the supermarket and easily bought a steak to put on the BBQ this evening. But imagine 14 years of wartime rations. Four-teen years. How did they do it? Of course they did it because they had to, but for the regular person who couldn’t afford to go to a fancy hotel for dinner, it must have been so drab. Another very brief blog this evening. Today has been ‘leftover’ day – soup and coleslaw salad at lunchtime, mince and tatties for dinner – so I haven’t added any photos. What I am quite pleased about is that I still have quite a lot of butter, milk and cheese left for the weekend, so I’m hoping to get some baking done on Sunday. Given how important the role of the housewife was in the war effort, I’m really surprised there are very few archival films out there depicting the challenges they faced. I’ve been very fortunate in being able to buy all my ‘rations’ at my once weekly shopping and store meat for later use in the freezer. I can’t imagine how hard it must have been to have to queue almost daily at the shops, not even knowing if there would be any food to buy to make an evening meal for the family. And can you imagine how miserable it must have been in the winter when it was cold, wet or snowy? Anyway, here is one video I did manage to find – about how to cook cabbage correctly. Anyone else annoyed that the girls have to do all the work while the boys stay outside playing? ?